Stainless steel platform with extra-large weight display. Platform Size 14.5" x 12.5"
Scale Size 15.25" x 12.75" x 1.5"
Sleek Design Sure To Complement Any Home If you're on the hunt for a great looking, high capacity bathroom scale for your home, look no further. The Taylor 7410 is an affordable scale with the looks and features of a high dollar instrument. The 7410 has a stainless steel weighing surface that is great looking and easy to clean. This bathroom scale's sleek platform is complemented with its bright blue, backlit weight display and huge digits. The result, a gorgeous bathroom scale that will be a great addition to any home. Extra Large, Easy To Read Backlit Weight Display A lot of the bathroom scales ya see around have a teeny tiny weight display. Now, that's fine for most people, but not if ya have trouble seeing that tiny stuff. Taylor designed this digital bathroom scale with a great big, blue backlit weight display with digits that are two inches tall. This feature is great for users with not-so-great vision. Great Looking Stainless Steel Platform The Taylor 7410 has a stainless steel weighing surface that looks great and is easy to clean. Step And Weigh Feature You won't have to bother bending down to switch this stainless steel bathroom scale on...just step on it. 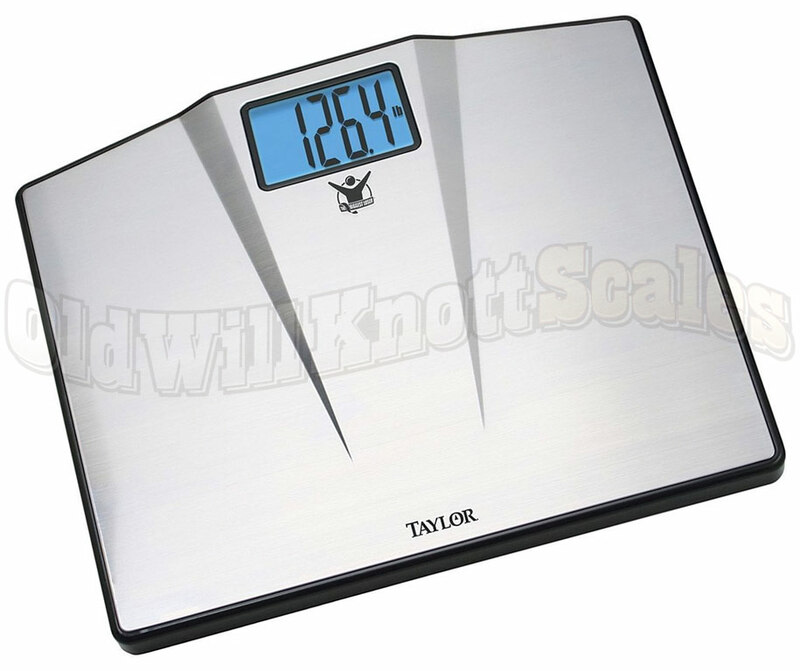 When you're ready to weigh, just step up on the Taylor 7410. it'll turn on and you'll see your weight readings in no time. Pretty easy, huh? 5 YEAR MANUFACTURER'S WARRANTY! Taylor provides a five year warranty on every scale they make. So, if ya have a problem with this scale within the first five years ya own it, just send it to the Taylor warranty center. They'll fix it or replace it and send it right back to ya. Inconsistent readings...don't bother buying this product. Perfect scale, lightweight, wide enough to hold us bigger people. It’s great!!! Very good product very satisfied. Works very well and it is accurate too my Dr. scales. 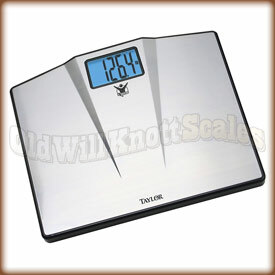 I do recommend this product to anybody that’s looking for some good reliable scales!!! It does what is required of it. Very good price and the service was great. thanks again. It's a great scale. Right price. Works great for my husband. And its stainless steel look is nice too. Nice wide platform to stand. Love the display. So far I am very impressed with my new scales. I purchased this specific scale because I have a son who is over 400 lbs and can not even weigh on a doctors scales. He said it was able to give him a weight even though he was not happy with the weight. I was looking for a scale to give me an accurate reading I compared this one with my gym scale and the doctors scale and it matches them so I am pleased with that. It is very easy to use nothing complicated. So far I am happy with the purchase. The scales arrived quickly and undamaged. I needed scales that would support my 500 pound frame and these do the trick. They weigh me accurately and safely. Highly recommend the product and the company! Great scale. Average scales were not great for me and my husband. We both weigh over 400 pounds. We normally would have to wait for doctors visits to get an accurate weight measurement. Now we can do so with ease at home. Thanks to God and Old Will Knott for making this blessing available to us. May God bless your business for all of us out there who really needs it. This a VERY NICE scale and a great VALUE! It reads almost instantly and is very well constructed with stainless steel. Better get one before everyone realizes that this product exists! I love my new scale. It has a great sleek stainless steel design and I really like the lighted display. I would recommend this scale for anyone looking to purchase one. After looking for a week or so, someone told me about this scale. Let me tell you this scale does not disappoint! Large enough for me to stand on comfortably and had a big read out. I've had this scale for a couple of weeks. So far the scale has worked perfectly. I'm finally able to track my weight loss without going to the feed store. I'm a big guy at 525 lbs. My goal weight is 275-300. Hopefully with the help of this product, I can monitor the weight loss weekly and reach my goal weight with a little hard work and will power. It gets the job done on what you need it for. The only downfall that I have on the product is that you can weigh yourself and it says one thing, and when you step off and right back on it could either be a little less or a litte more than what it was before. But for the most part it works, I still LOVE it and that's one of the main reasons why I always have a goal to get healthy and stay healthy; numbers don't determine whether your healthy or not. It does what it needs to for the most part and the price was awesome!! I will be recommending this company to everyone I know that is in the market for a scale!!! Two Thumbs Up!! It's a great product, but the light turns off to fast before get your reading. Other than that I'm satisfied. This is a great scale. It does its job and both my husband and I are big people. It's helping us stay on track with Weight Watchers! This scale seems to be pretty accurate as I have been using it daily and the readings seem to be almost the same as the scale at the doctors office, so I have to give this item a thumbs up! I am really enjoying this scale! It is very accurate and easy to use..I would recommend this sight to my friends, also I have lost 34 lbs. Since I got my scale!! Leg up on my game. This is a great product. Losing weight is difficult when you don't even know how much you currently weigh. This product allows me to check and keep track of my weight and I'm already making progress. This was a gift for my Husband. He is 6'4" and around 300 lbs. We have tried many scales at home and they don't work. We were so excited these worked as he is tracking his weight loss and this gives encouragement. They work perfect, we checked against dr. scales. There is plenty of room for his size 15 foot and the scales are very easy to read from that height. I'm a big man and this scale is nearly perfect. Easy to use, no complications, no frills, just accurate weight by stepping on a generous deck, wait 3 seconds, look down and smile. Arrived quickly as advertised. The only criticism I have is the adhesive for the rubber feet isn't as effective as it should be. Once on the floor it doesn't matter though, but if you plan to move it often a drop of glue would help. Gorilla glue works with half a drop. Lol. I'm very happy with this product. I love this scale. It has large letters that are easy to read and has a back light so you can read it day or night. It also has a nice large base that is very stable. I difineately recommend it. WE TRIED IT OUT AND WE LOVE IT. EASY TO READ EASY TO USE. LARGE PLATFORM IS PERFECT FOR OVERWEIGHTERS. Weighs in Stones and Pounds how cool is that! This is a great scale and is pretty. We are so pleased with this purchase and glad we found Old Will Knotts. Requiring a scale with a high capacity, I had bought this scale through another company for my home, and it has been great - easy to use, easy to read, and consistent. When my son visited his grandparents, I ordered the one through Old Will Knott Scales for him to use there, at just over HALF the price I paid elsewhere. Shipping was messed up due to problems with FedEx, but Old Will Knott Scales refunded the expedited shipping fee I had paid IN FULL! I will definitely order through here the next time I need a scale, and recommend it to my friends!